Creating a plan is one thing, keeping track of the actual status is another thing as you will have many moving parts. 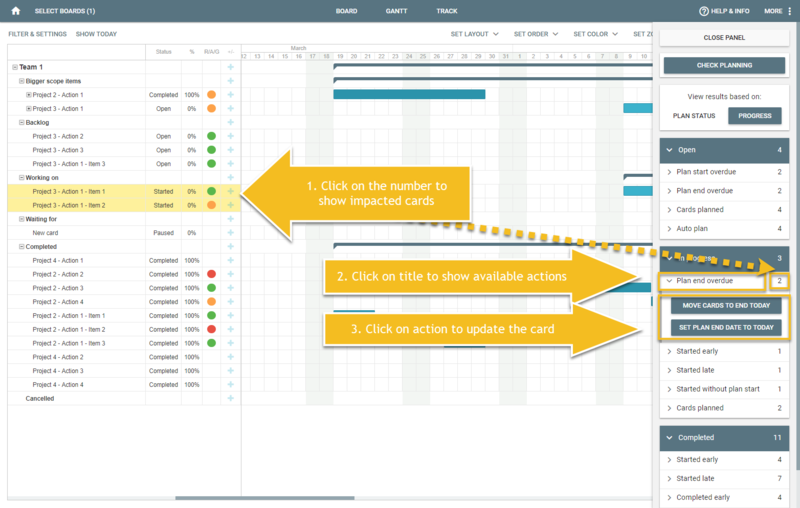 We introduced 'Plan-check' on the Gantt chart to help you check your planning, and fix inconsistencies. Please note that this feature is evolving and we would like to get your feedback to make it more intuitive and extend the checks/fixes that we can provide. 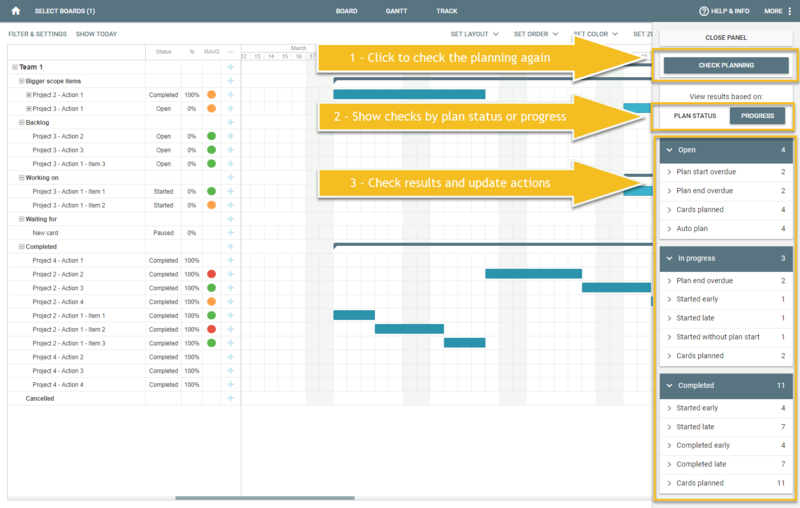 In the gantt chart, you can access the plan checks from the plan check menu, here you can select 'check planning' or 'check effort ratio' to get more insights on your planning. When to select check plan or check effort ratio? When you like to understand how cards are planned and resolve planning conflicts like cards that started late, go to check planning. When you want to understand if the amount of effort that is left is enough to finish your plan, go to check effort ratio. When you click on select plan, the right hand panel will open, and the current planning will be checked against a number of checks. 'Check Planning' button will check the planning again, this could be needed sometimes when cards are updated by someone else. 'View results by' will set how the check results will be shown to you, you can show them on plan status (more useful in the plan phase), or by progress (more useful when the project is in run phase). Check results, shown by plan status or progress, this shows a list of the results of the checks, and the option to update them if you want to. When you click on any of the numbers in the panel, the related cards will be highlighted in yellow, so you know where they are. When you click on the category/title (like plan end overdue), you can view the actions that are available to fix this. When you click on an action, the action will be taken. When you hover your mouse over the button, a description for each action is shown. In this case, for overdue cards, you can move the plan date of the cards to match today. An explanation of all checks and how to use them will be added.